SJU’s Holy Land pilgrimage is more than a vacation or tourist trip. Travelers encounter a spiritual journey in the Footsteps of Jesus. Interested in a pilgrimage to the Holy Land? Maria Frain dipped her toes in the calm turquoise water of the Sea of Galilee and felt the coolness wash over her feet. Tears streamed down her cheeks as the presence of God overwhelmed her. She imagined Jesus walking on the lake and appearing to the apostles after the resurrection. At the Church of All Nations near the Garden of Gethsemane, Chris Grodecki, S.J., a Jesuit scholastic who taught philosophy at SJU for two years, kneeled before the Blessed Sacrament at the “rock of agony” where Jesus prayed on the eve of his arrest. Grodecki closed his eyes, rested a hand on the stone and felt he was there with Jesus, keeping watch with him, praying with him. Louis Horvath climbed the stairs to the second floor of the building on Mount Zion, ducked his head under the doorway and stepped into the “upper room,” unadorned except for a few pillars and a vaulted ceiling. He paused, taking in the power of this historical place, believed to be the site of the Last Supper. 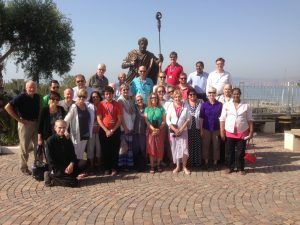 “Every day was profound,” says Horvath, director of SJU’s graduate health services programs and adjunct professor, of his experience on the University’s 10-day Holy Land Pilgrimage with Frain, Grodecki and 24 others this past June. He says that while he initially had no special desire to go to the Holy Land, the idea of blending an educational tour with a spiritual journey captivated him. “To walk in the footsteps of this historical figure called Jesus is truly remarkable,” he says. The key, the travelers say, to the perfectly paced, enlightening and enjoyable trip is organizer Brendan Lally, S.J., rector of Saint Joseph’s Jesuit community, who plans every detail, including the well-appointed accommodations. This June, Fr. Lally will lead the pilgrimage for the 25th time. A tall, slender man who speaks softly but with intention, Fr. Lally remembers that he hesitated when first approached about forming a pilgrimage in 1985, when he worked at the University of Scranton. Today, he says he’s “compelled” to guide participants — alumni, faculty, staff, students, Trustees, religious women, families and friends of Saint Joseph’s, along with other Jesuits — through “the footsteps of Jesus in the holy places associated with His earthly presence.” Fr. 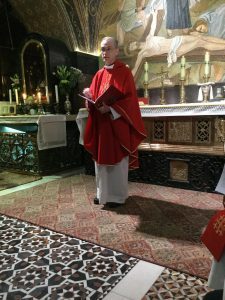 Lally incorporates Mass, celebrated by one of the Jesuits at each holy site, into the daily itinerary, along with time for reflection and prayer. “I want them to experience the joy of the gospels in a new way,” he explains. By all accounts, he’s succeeded. Together, they renewed their baptismal vows at the Jordan River, where Jesus was baptized, and viewed the tomb of Jesus, the size of a small walk-in closet, inside the Church of the Holy Sepulchre. 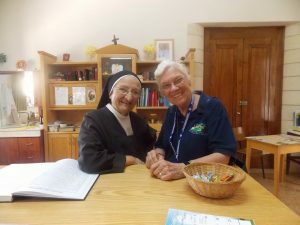 They visited the Mount of Beatitudes, known as the site of the Sermon on the Mount, where they encountered the lovely and feisty Sr. Mary Rose, who acquired the nickname “hawk on the hill” when they discovered she had attended Saint Joseph’s many years before. To honor the University’s patron saint, the foster father of Jesus, Fr. Lally brought the pilgrims to the Church of St. Joseph and the Tomb of the Just Man in Nazareth.